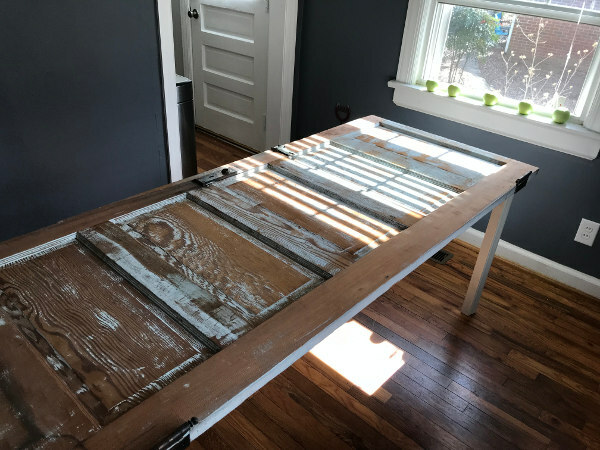 Here’s a step-by-step guide to making a stable, functioning table out of a classic, reclaimed door. After the build, a tempered plate glass top is all you’ll need to finish off the piece! My client supplied an awesome five-panel door for our project, so I didn’t have to go hunting for one. If I had, though, I would have headed straight to the local Habitat For Humanity “Restore” down the street. Companies like Habitat have started these large, warehouse-style architectural salvage stores all over the country. 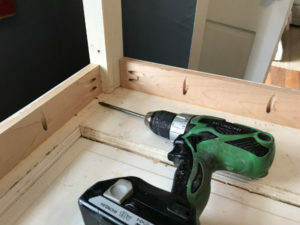 They work like consignment shops, where people can donate reclaimed materials that they have pulled out of houses undergoing remodels or demolition. 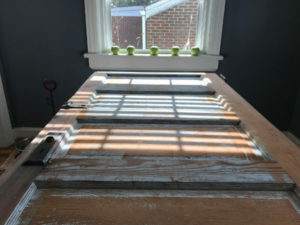 If you live in a historic neighborhood, you can also try asking your neighbors if anybody has an old door lying around in a basement or attic. I’m always amazed at how many I come across in pre-1950’s homes. I was surprised at how well the handrails worked, but they can be tricky to attach to. If you want to take a more conventional route, you can pull legs off of another old table that you find. You can also order new table legs. They tend to come unfinished, so you can paint or stain them as you wish. They range widely in price, so shop around. Tables tend to sit at a height of 28-30”. Most new, ordered legs are going to come at this height, as will legs that you pull from another table. If you’re making legs out of salvaged materials, you really can’t go wrong with a 28” leg. 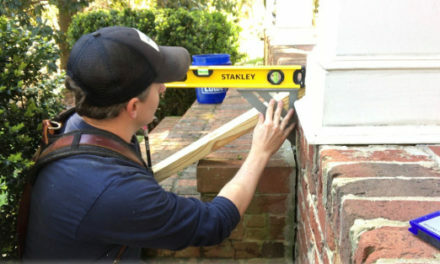 Just use a miter saw, circular saw or even hand saw to cut four legs at an even height. Also, consider adding pads to the underside of the leg to protect your floor. 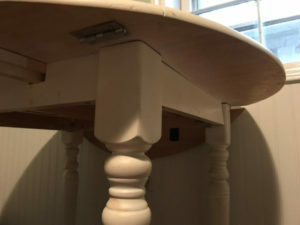 Table aprons—or “skirts”—are horizontal pieces of lumber that sit flush to the underside of the table and connect to the legs. Aprons really only have to be 3” wide or less. 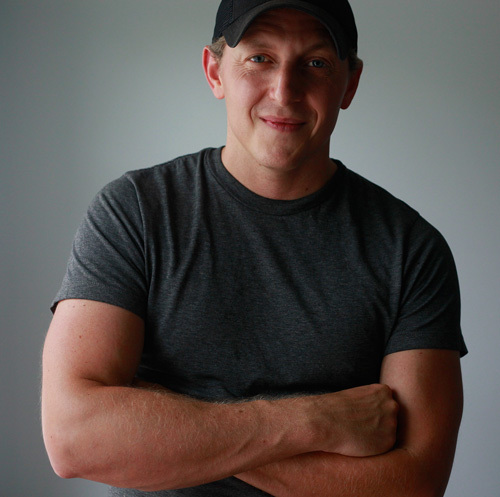 If they’re any wider, they begin to take up too much room beneath the table, and you can bump your knees into them. I made the apron for our table out of reclaimed poplar that I pulled out of an old door casing, which I ripped down to 2-1/2” width on the table saw. Almost any species of wood will work for your apron if you’re going to paint it. You can reclaim some like I did, or buy some new from the lumberyard. If you don’t feel like ripping any down, you can simply buy 1X3” material—which is actually ¾” X 2-½”. To figure out how long your apron pieces have to be, just flip your table over and sit one of your legs experimentally on the underside in a corner. You want the legs to sit outside of the door panels—that is, on the solid, thicker wood around the perimeter. This is necessary, because we’re going to need to screw into this thicker lumber. Trace the outline of your table leg at this location, then do the same at the other three corners. Now, measure the distances between your various lines. These are the lengths for your four apron pieces. Cut your apron pieces with a miter saw or table saw. 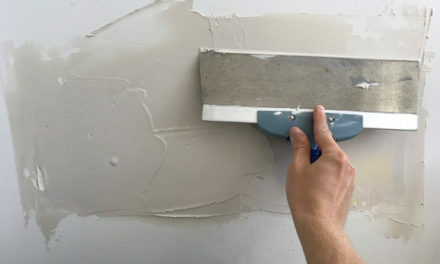 But, be sure to “square up” one end first (like I did in the picture above)—in other words, make a clean cut near one end of the piece to start. 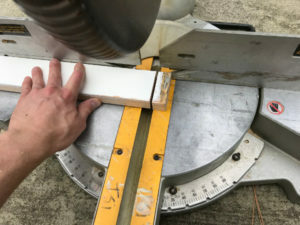 You can pull your measurement from this end, and when you cut at the measured line, you’ll have two nice, square ends to attach to the legs. 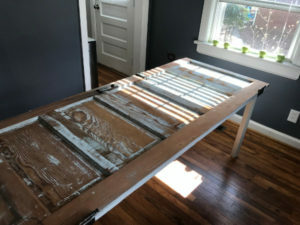 Test fit your apron pieces and legs by flipping the door over (preferably on saw horses, if you have them), and laying out the components in their locations. 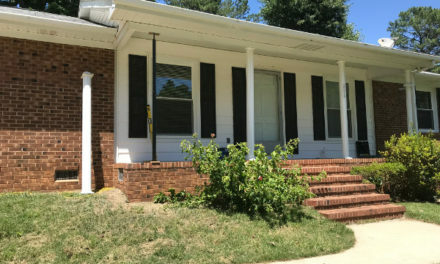 As mentioned before, you want the apron to ride around the perimeter of the door, but set in a few inches from the outer edge. If the footprint of your apron looks good, you can begin to attach things. 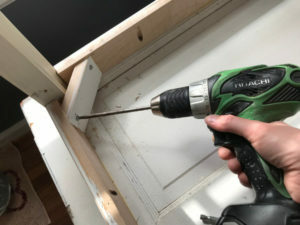 I use a tool known as a “Kreg Jig” to connect the apron to the door. It’s not absolutely necessary that you have one…BUT…I really can’t stress how invaluable these gadgets are. 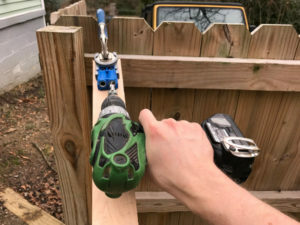 The Kreg Jig lets you attach the edge of a board or piece of lumber to the face or edge of something else. 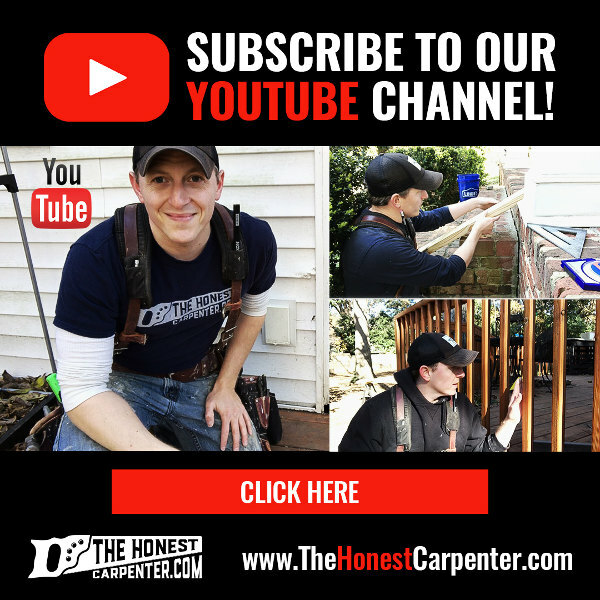 All in all, this function pretty much changed woodworking. Here’s a link Kreg’s own page detailing how their Kreg jigs function–check it out, it’s amazing! 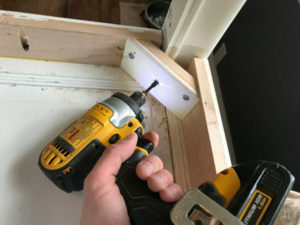 I just use a Kreg clamp to attach the jig to the board wherever I want pocket holes. Then, with a Kreg drill bit that comes with the kit, I bore through the jig and back the bit out to clear the waste. What I’m left with are elliptical holes with little seats down inside the shaft. I place pocket holes like this every foot or so across the long run of the apron piece, and two at the end. Taking the boards back to the table, I attach them with glue and 1-1/4” pocket screws. You can attach them to the legs first at the ends, then move the whole assembly around until it’s right where you want it, and attach the apron to the table itself. As I said, it’s not absolutely necessary to use a Kreg Jig here. You can accomplish the same thing with angle braces and wood glue. 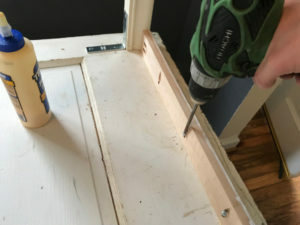 The Kreg Jig is just the best method. To finish the project, cut short pieces of your apron material with miters on both ends. You want the pieces to be just long enough to reach across the inside corner of your apron where it meets the legs (about 4” from long point to long point for my project). 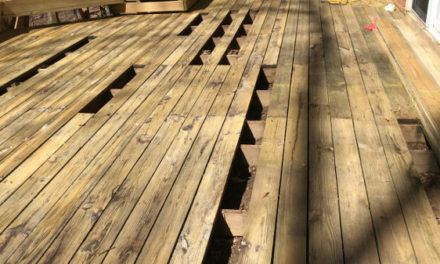 Use a miter saw to do this if you have one. If you don’t, you can probably still manage it with a backsaw and a miter box. Attach your four angle pieces to the apron with 1-1/4” screws. Then, drive one longer screw (about 3”) through the corner brace into the leg. This will really help the leg fight the leverage working against it. When you’ve done this to all four corners, you’re set! Just flip the table over and check it for firmness. As I mentioned before, a custom piece of tempered glass is all you need to turn the paneled surface of your door into a flat surface that’s perfect for holding dishes and glasses. Furthermore, smaller doors can be converted into tables in much the same way! Half-doors can make great end tables. The method is always the same: cut your legs to height, create an apron, and screw the components into place. So, what are you waiting for? Go find your door!